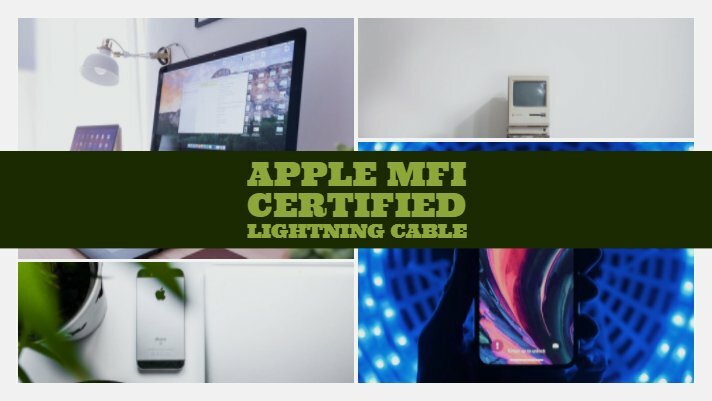 In this article, we have listed out some of the best Apple MFI certified lightning cable that we currently recommend. If you are looking for a good quality lightning cable for your iPhone, iPad or iPod, this post might interest you. There are a lot of charging cables available in the market for iPhone or iPad. But most of them don’t follow a proper standard. As a result, the charging current might not be appropriate for your iPhone. It might weaken your battery power over time, and even increased the chances of your iPhone to catch fire. Every time you plug a non-MFi lightning cable in your iPhone, your phone will show a warning message stating that you are not using a standard cable. Now you must be wondering, How does the iPhone detect that. Well, there is a small chip in every Apple MFi certified product that your iPhone or iPad can identify. The MFi symbol signifies that the product is certified by Apple and is safe to use with your Apple device. A recent study shows that 99% of the Apple chargers bought online fail a basic safety test. I don’t want to scare you, but this is just to warn you about the fake products in the market. There are lots of high-quality lightning cables that carry the MFi certification. I have the best of best Apple MFi certified lightning cables for your iPhone, iPad or iPod. Starting the list with the most affordable yet Apple MFi certified high-quality lightning cables. Enther USB to lightning cable is a 6 feet long charging cord for faster data transfer and efficient charging of your iPhone, iPad or iPod. The thick white cable is durable and made up of high-quality material. Its 6 feet long size gives you the flexibility to use the device while charging. For peace of users mind, it comes with 100 days satisfaction guarantee. If you don’t like the cable, you can return it without any hassle within 100 days from the date of purchase. Miger 4 feet lightning to USB cable comes in three color options Blue, Green, Gold, and Red. The color cables give your charger a different look. This cable is MFi certified so your iPhone, iPad or iPod whichever you use won’t show a not compatible warning sign. It is stylish, convenient and durable. It is very sleek so you can just pack it in any small pouch or carry it in your pocket. You get 12 months of warranty. At just $5 this is one of the great options you could buy. Anker lightning cable for iPhone is one of the best rated on Amazon. It is a 6 feet lightning cable available in five colors. It is ultra-durable thanks to the Aramid fiber that makes it thoroughly resistant to wear-related and fraying damage. The wider diameter wires and reduced core resistance ensures the efficient charging. Also, its long length gives you the flexibility to use the phone or tab while charging. If you still not convinced, it comes with 18 months of warranty and friendly customer support 24 x 7. RavPower lightning cable is a high-grade charging cable for iPhone designed especially keeping the durability in mind. The wires measure 3.5 mm in diameter and come in two sizes 3 feet and 6 feet. The textured spiral design withstands more wear and tear. It supports fast charging allowing maximum current up to 2.4A and easily handles the demands of 2A charging. Like the Anker lightning cable above, RavPower MFi certified lightning cable also comes with 18 months of warranty. One of the most selling Apple MFi certified lightning cable on Amazon is From the Amazon accessories manufacturing unit AmazonBasics. It is a 6 feet long cable available in two colors black and white. It connects to your iPhone, iPad or iPod with lightning connector. This thick cable has an additional layer of protection at both the end to improve the durability. This cable has been tested to bend 95-degrees for over 4000 times. Also, it is backed by 1-year limited warranty from AmazonBasics. Voltmax Apple MFi certified lightning cable that makes it fully compatible with iPhone, iPad, and iPod. The reinforced military-grade aramid fiber inside the soft TPE layer makes it extremely durable than necessary. It is fast, safe and comes in five color options to give you the option to move ahead with the native black and white cables. The premium quality gold-coated connectors to provide extra lifespan.Voltmax lightning cable is backed by 18 months of hassle-free warranty. If 6 feet charging cable feels short to you, we have a 10 feet Apple MFi certified lightning cable for you. TheUltimateBundle 8-pin charging code made for iPhone, iPad and iPad is tested to withstand over 10000+ bends. The TPE layer not only feels soft to hands but also makes it even more durable. Slim yet durable connector headworks works perfectly with most of the cases and covers. But with its 10 feet long size, the charging capability will be slightly affected. TheUltimateBundle comes with 30-day free returns and 1-year warranty. Looking for something different than the TPE covered lightning cable. We have two options for you. Kinps Apple MFi certified lightning cable is a super long 10 feet charging cable for those who need more flexibility. Tested for over 5000+ bends, you can have an idea how durable it will be. But what is most interesting is that it is Nylon braided cable, and it comes with 24 months warranty. You can choose from three colors, Red, Black, and Silver. It is slim, stylish and longer than most of the cables out there in the market. We hope you like our post on the best Apple MFI certified lightning cable for iPhones. For suggestions or questions, do not hesitate to drop us a comment below. Thanks for visiting.